A street easily overlooked in Saint Paul is Irvine Avenue. It is located “below” Summit Avenue, and you can look up to see the back sides of the most expensive historic homes on Summit. A few great finds are some of the remaining carriage houses of these massive homes.. 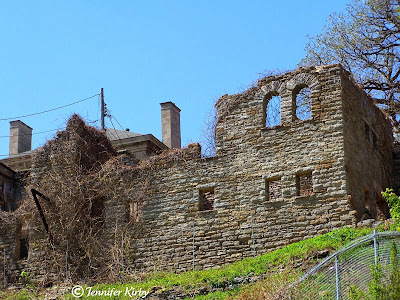 Some have been saved and converted to single family residences or condo units, but others, like the fantastic ruins pictured above are slowing decaying away. This old carriage house sits behind 332 Summit Avenue…you can see what it used to look like, as of 1950, from this photo. It is a protected historic structure so any future plan to restore or demolish the building would have to meet Preservation Committee approval.